Looking to update your kitchen but working with a limited budget? Consider refacing your cabinets rather than replacing them. Refacing cabinets consists of installing new door and drawer fronts and hardware and covering the exposed face frames of the cabinets with a matching wood or plastic veneer. There are three finish options: plastic laminates, rigid thermofoils (RTF), and wood veneer. Wood veneer is the most expensive option, but it is also the most attractive. Reduced cost is a key factor in refacing versus replacing kitchen cabinets. While refacing can cost as much as $3,500, it still typically costs 50% less than replacing cabinets. Sears offers free estimates for cabinet refacing. Refacing is also an excellent choice if your home was built more than 30 years ago. Your existing cabinets are probably made of wood or plywood. New cabinets, unless they are custom-made, are likely going to be a combination of wood, plywood, particleboard, and MDF. By refacing, you keep the quality cabinets but improve their appearance. 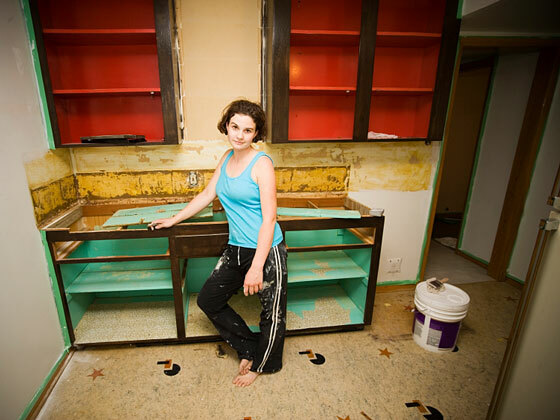 If you are an experienced and conscientious do-it-yourselfer, you can probably tackle cabinet refacing yourself. Detailed instructions are available from Mr. Refacer at KitchenRefacing.org. However, most homeowners will get the best results by hiring a professional. Keep in mind, though, that different companies have different definitions of cabinet refacing. Some build new drawers and doors for existing cabinets while some clean the cabinets, install new veneers, and add new hardware. If you choose to go with a professional, be sure to specify exactly what you want done. It typically takes a professional two to four days to finish a cabinet refacing job.